Aamir Khan and Amitabh Bachchan starrer Thugs of Hindostan is all set to release this Diwali. Amitabh Bachchan and Aamir Khan. 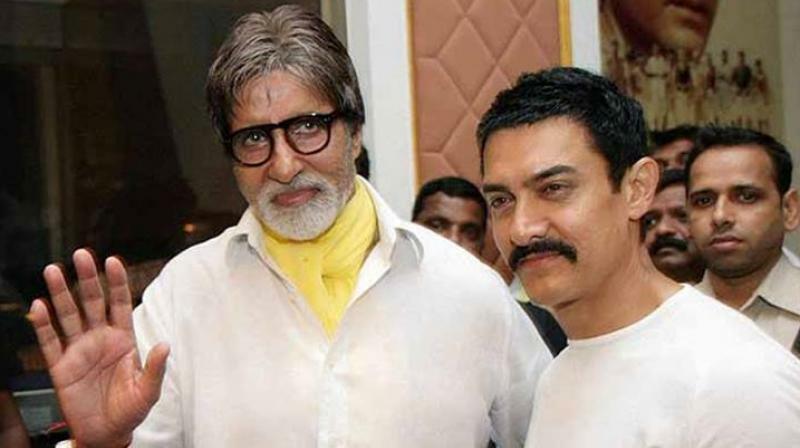 Mumbai: Two Bollywood megastars Aamir Khan and Amitabh Bachchan will be seen in together in Thugs of Hindostan. The epic action adventure drama is all set to release this Diwali and ahead of the film's debut in cinemas, the makers have been promoting the movie by sharing exciting clips of the making. In a recent video shared by Yash Raj Films on Twitter, both Aamir and Amitabh can be seen showering praise on each other. “I have been such a big fan of Mr Bachchan all through my life and I don’t know whether the present generation would realise what it would mean for someone of my generation to be working with Mr Bachchan. He has got an amazing aura about him and I have to say that it has been a really enriching experience doing this film with him and working with him,” Aamir said as viewers were shown glimpses of how the magnum opus was filmed. Towards the end of the clip, Mr Bachchan had some lovely and encouraging words to say about Aamir as well. “Aamir himself is a great human. He is a writer, director, producer, distributor...all rolled into one and at the end of it, he is this brilliant artist and it is difficult to battle him in any sphere. It has been a joy working with him,” the megastar candidly said. Bankrolled by YRF, Thugs of Hindostan also stars Katrina Kaif and Fatima Sana Shaikh in pivotal roles. The film will release on November 8.